I have a love-hate relationship with scones. In the category of breakfast breads, they are at the top of my favorites list. In the category of baked goods that are guaranteed to be worth the hassle, they have spent a lot of time at the bottom of the favorites list. I have collected scones recipes for years, hoping to find the magic formula for yielding a tall scone with craggy corners and a supple, soft interior. I finally found a perfect base recipe that can be customized with the add-ins of your choice (chocolate chips, dried fruit, blueberries, etc.) or left plain and used as a base for shortcakes. The components of the recipe are quiet straightforward. Cold butter is mixed with dry ingredients, and then wet ingredients are added. Roll them out, cut and bake. Scone dough is messy. But most things worth having are messy along the way (children, marriage, friendships...and scones). All good things are worth the mess. Cold butter is essential when making scones, and you should see large chunks of it in your finished dough. These bits of butter create steam when they hit the oven, and that steam lifts the dough creating the flaky texture we all love. 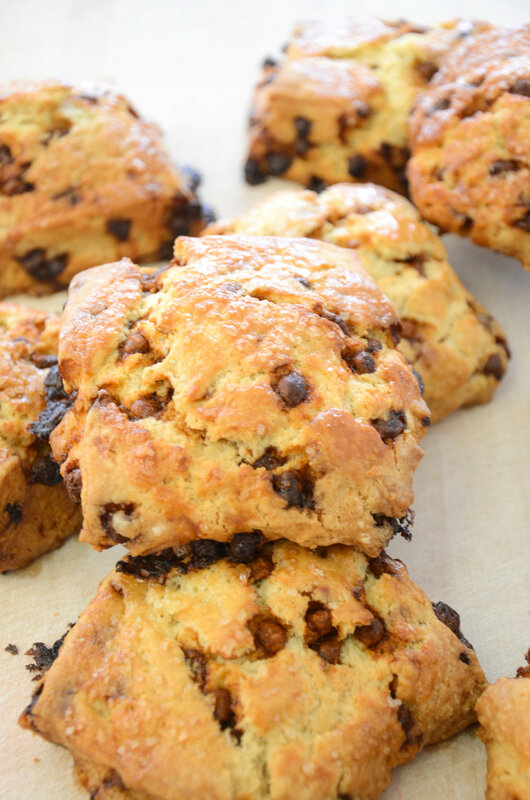 Ready to get started on your own batch of scones? Click below for a printable version of the recipe. Looking for cinnamon chips? Hershey's Cinnamon Chips are sold in some grocery stores, or are available in their online store!